Amazon.com is also listing a Bonus Edition for the 3DS version, though SEGA hasn’t announced a Bonus Edition for that platform. Note: All prices correct at time of this article’s publication. Will you be buying the Limited/Bonus Edition? Let us know in the comments. 3DS version may be completely different and most likely is.. like Generations. What’s the “Metal sonic mod-pack”, how is it different from the actual playable character? Pre-ordered for the 360! Can’t wait. Already bought it with Amazon (Seriously. £30 is a steal).Is That offer exclusive to those retailers or will it be at every retailer? Quick, someone get sega on the case! I expect other retailers will start listing it soon. Yeah.. someone explain the mod pack.. can we mod Metal Sonic and give him a paint job or something? Sumo Digital and SEGA haven’t spoken about mod packs yet, other than that they exist and that they apply to the vehicles, not the characters. I swear, if this is like Generations where you can’t buy the special edition in the U.S. I will have to strangle somebody, No “May have to” I will legitimately strangle someone to near death. I mean, I like you guys, and I wish to go to Europe someday and spend some time there, but this is friggin ridiculous. The United States has die-hard Sonic fans too SEGA! Dont forget about us! 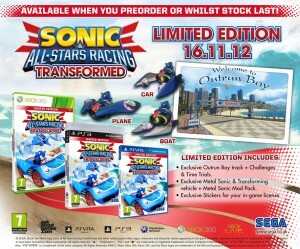 SEGA of America already announced the Bonus Edition for the US. Looks like Amazon.com is stocking it. I had a feeling that it wouldn’t be the case as with Sonic Generations, but Im just still so upset with that mishap. Thanks again Shadzter! This is going to be SO GOOD….! Though, I’m surprised that the Outrun track starts with you turning right. I hope they make this stuff available on Steam. I want to run wild on that OutRun track. . . I hope it will soon be available in Australia, I remeber how lucky I was when I preorded Generations and a week later I got a phone call saying they also preorded the collectors edition too! If I’m lucky the same thing will happen to this game too! Still don’t understand why the US got shafted with it, did SEGA ever give a reason?